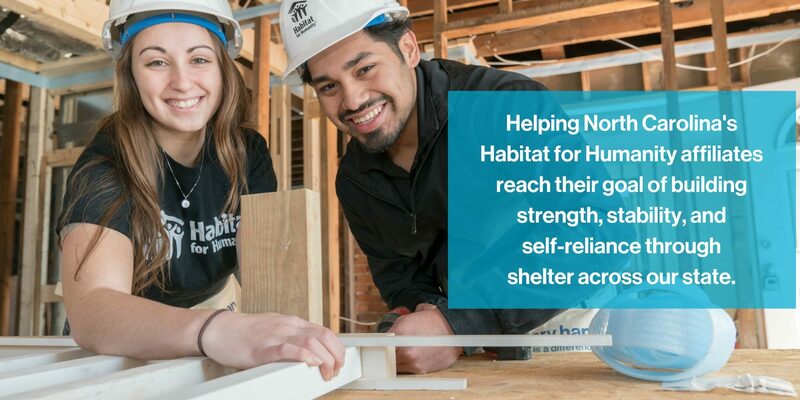 Habitat for Humanity of North Carolina (Habitat NC) is a 501(c)3 and one of 31 state support organizations (SSOs) across the country. Founded in 2008 through the efforts of local affiliates, Habitat NC facilitates increased housing production and neighborhood revitalization efforts across the state by providing a central agency to coordinate advocacy activities, provide training and technical support opportunities, aid in disaster recovery and serve as a focal point for disseminating statewide resources. North Carolina’s Habitat for Humanity affiliates are not subordinate to the SSO, rather, we exist to serve them. Habitat for Humanity is a Christian organization seeking to put God’s love into action, but observes a strict no-proselytizing policy. All who believe that everyone needs a decent, affordable place to live are welcome to help with our work, regardless of race, religion, age, gender, political views or any of the other distinctions that too often divide people.